Are you a #writer? Take this quiz. Are you a writer? Take this 51-question quiz to find out! This is the fourth in a series of self-tests to help you determine if you are a writer – someone afflicted with the compulsive need to express yourself in words at any time of day or night. Being a writer is a terminal condition; it cannot be cured, only managed. One of the best ways to manage being a writer is with humor. So we take the humorous approach to diagnosing your condition. Take this writers quiz, then feel free to share your results in the comments below…if you dare! Read here the first 54 ominous signs that you might be a writer. Read here the second 52 signs that you might be a writer. Read here the third 51 signs that you might be a writer. If people still wonder when you are planning to grow up, you might be a writer. If you have ever listed “day dreaming” as your favorite hobby, you might be a writer. If you keep getting an error for passing the word limit on Facebook posts, you might be a writer. If you keep getting an error for passing the word limit on #Facebook posts, you might be a writer. If your eyes are locked in a permanent strain, you might be a writer. If you sit for hours on end without moving, you might be a writer. If you forgot to eat yesterday, you might be a writer. 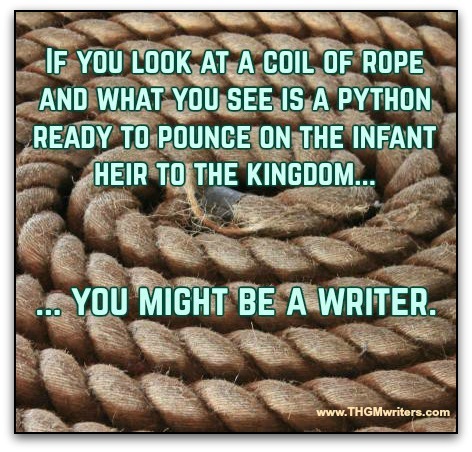 If you look at a coil of rope and what you see is a python ready to pounce on the infant heir to the kingdom, you might be a writer. If you’ve ever petitioned City Council to rename Main Street “Sesame Street”, you might be a writer. If the best parts of your vacation are the blog posts about your trip, you might be a writer. If you’ve ever woken up late at night with your head on your keyboard, you might be a writer. If lawyers get frustrated trying to confuse you with obfuscations, you might be a writer. If every model in the Sears catalogue has a name, a story and a tragic death, you might be a writer. If you are unclear on the difference between an editor and a predator, you might be a writer. If you refuse to vote for anybody but a write-in candidate, you might be a writer. If your shadow puppets all look like letters of the alphabet, you might be a writer. If you know that “kill fees” have nothing to do with having a price on your head, you might be a writer. If you get more annoyed at the GPS spelling a street name wrong than you do at sending you to the wrong town, you might be a writer. 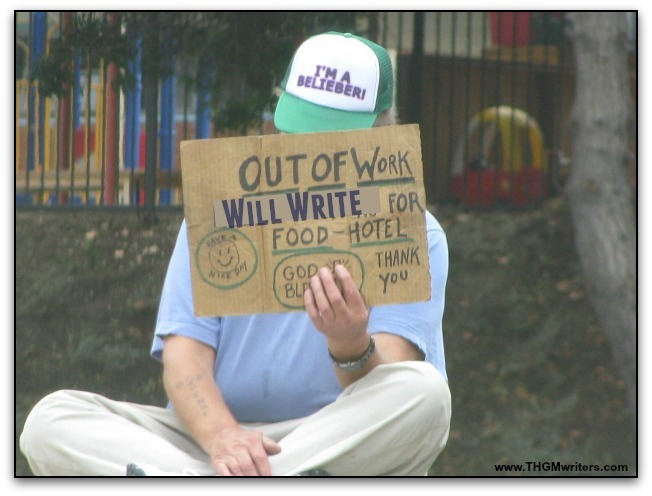 If you’ve ever made a sign “Will write for food”, you might be a writer. If you can describe Kim Kardashian’s most prized assets in 32 different ways, you might be a writer. If your principle use for table cloths, cocktail napkins and toilet paper is not what the packaging suggests, you might be a writer. If you carry a thesaurus in your purse, you might be a writer. If you’ve ever given your pens and pencils names, you might be a writer. If you still haven’t recovered from the tragic burning of the Library of Alexandria, you might be a writer. If you kill people for a living – and love it! – you might be a writer. If dismemberment runs a close second to typos on you list of “Things I Don’t Want to Happen to Me”, you might be a writer. If you figure the Garden of Eden could not have been all that great, because it had no books, you might be a writer. If you consider numbered bullet points inferior to lettered bullet points, you might be a writer. If you go around proofreading license plates, you might be a writer. If you hold library cards in more than three states, you might be a writer. If that strange noise coming from the engine when you drive makes you think of foreshadowing rather than of the garage, you might be a writer. 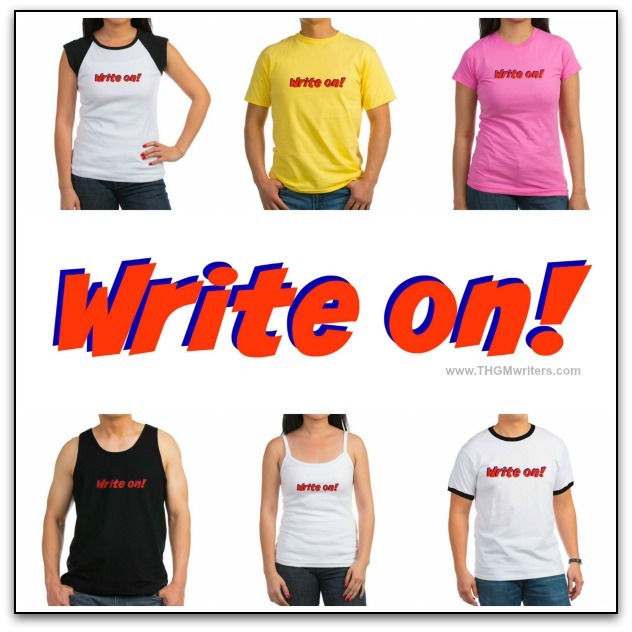 If you own more than three T-shirts that say “Write on!”, you might be a writer. I actually designed these six T-shirts just for this post, so please feel free to buy a “Write on!” T-shirt here. If people have to keep reminding you that they are called “donuts”, not “Os”, you might be a writer. 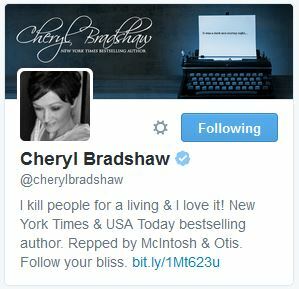 If all your Twitter followers have the word “bestselling” in their profiles, you might be a writer. If you snub your nose at classical music because it doesn’t have any words, you might be a writer. If you prefer alphabet-print dresses to flower-print dresses, you might be a writer. If you argue that California is better than Alabama because it has more letters in its name, you might be a writer. If you refer to reincarnation as “the sequel”, you might be a writer. If you refer to #reincarnation as “the sequel”, you might be a writer. If you’ve been trying to rewrite fa-la-la-la-la to make it more meaningful, you might be a writer. If every day you go online to check world ink inventories, you might be a writer. If you can locate at least 16 dictionaries in your house in under one minute flat, you might be a writer. If you’ve ever counted the words in the Bible, you might be a writer. If you bring a briefcase to the alter on your wedding day, because your wedding vows run just a little long, you might be a writer. 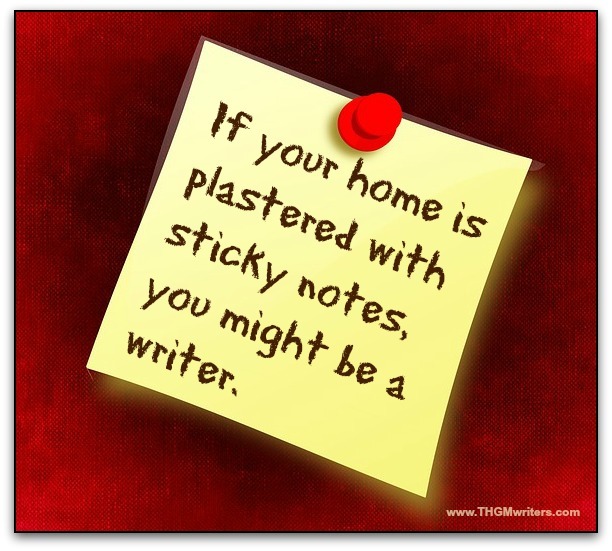 If your home is plastered with sticky notes, you might be a writer. If you’ve ever checked into the emergency room because of writer’s block, you might be a writer. If you’re always walking around with bags under your eyes because the characters in your novel refuse to go to sleep at night, you might be a writer. If you use the Kleenex in your purse as a note pad, you might be a writer. If you have ever punched somebody in the face for claiming that Sudoku is superior to crossword puzzles, you might be a writer. If your favorite kind of morons are oxymorons, you might be a writer. If you bring your laptop with you when Nature calls, you might be a writer. If you bring your #laptop with you when Nature calls, you might be a writer. If every Sunday morning you go to the library to worship, you might be a writer. If you break down laughing at hysterical puns that nobody else understands, you might be a writer. Hmmm. I think the fine line between compulsion and authorship has just been erased…. [ Smiles ] Oh well, it looks as though I am a writer! I can relate to far too many of your list items. I fear I may be terminal. Especially as I have been reduced to tears after breathlessly laughing for several minutes after reading your final point. Yet I am loath to describe myself as a writer, I have only recently taken to blogging. Perhaps ‘closet’ writer is a more accurate title for me presently. I truly love your work. Closet writer is just fine. My younger daughter plans to gut her closet to make room for a desk in it. Why not?